I first moved to Vancouver, British Columbia (Canada) two years ago. Being from eastern Canada, the sheer number of opportunities available for wildlife photography here was a constant amazement to me. This location is arguably one of the best in Canada for seeing all types of wildlife, including raptors, owls, bears, other mammals and all sorts of marine life. I continued my adventure recently by finally going to see some animals which I had been planning to photograph for a long time. About a year ago, I read an article written about Californian sea lions migrating up the coast to British Columbia, close to the docks in Richmond! I had read about sea lions in books as a child, but never had I been able to see them firsthand before. There is a tour that operates out of Steveston, and allows people to take a boat tour to view these see lines. What I had a few days off from work, I jumped on this opportunity. The tour operator was very nice and professional. Within 15 minutes of leaving the dock, we arrived at the point on the jetty where the sea lions were situated. It is truly a surreal experience to come face to face with a wild sea lions. They are, in some ways, dogs of the sea. As I learned, these sea lions are mostly males, which travel out to forage for food. The sea lions we came across are here for several months around springtime every year, and they eat the shrimp, which the water off of Richmond is rich with. It is a wonder to know to just minutes away is a bustling airport, while industry abounds with barges all around carrying big containers for shipping transports with tug boats and recreational boats as well as fishing boats alike. Amongst all this activity live the sea lions. 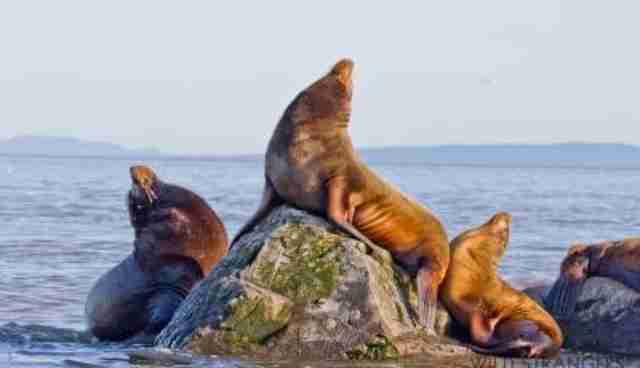 They were clustered together, and the California sea lions are easy to spot, as they have a darker color fur. 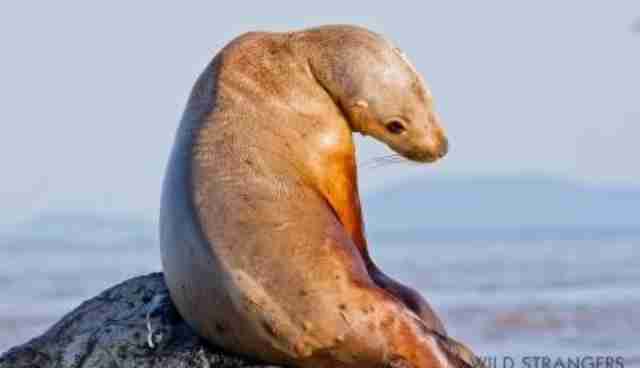 The light brown sea lions are known as Steller's sea lions, and they have a lighter coloration. Initially photographed them, I felt that the Steller's sea lions were more photogenic, but actually the Californian sea lion photos turned out extremely well as well. The sea lions were very noisy, and they made many barking vocalizations. 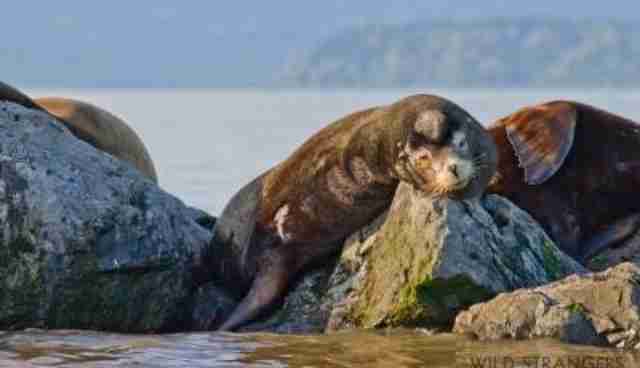 They had their heads pointed up towards the sky in order to help with cooling, and many of them were taking naps on the rocks, with one rock per sea lion. I tried to look for interactions among the sea lions, in order to make for more interesting photographs, and as you will see from this gallery, I did capture some of these moments. There was one in which I was particularly drawn to, and there are many poses from this sea lion witch I found quite beautiful. 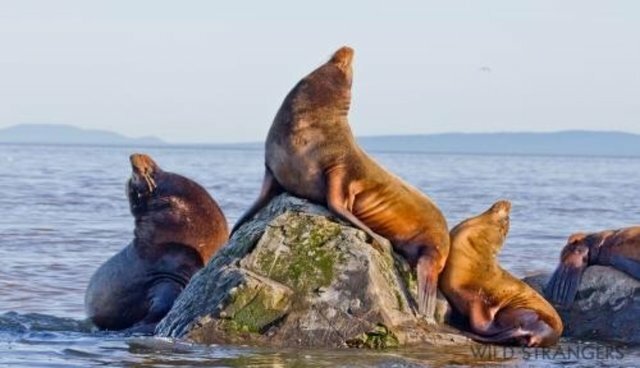 The neutral tones on the sea lion almost mimic human colors, and with the way they were posed on the rocks, it is easy to understand why historic sailors may have mistaken the silhouettes of these marvelous animals to be a mermaid sitting on the rocks. Sea lions are truly big in size, around 700 or 800 pounds. Although they appear to be small and cute in the photographs, they actually throw their weight around and are much bigger than they appear. The pups that are visualized in these images are not full grown, and I understand that there were several large males that swam off before we initially arrived. As I shot these photos, I imagine what it would have been like to try and hunt the sea lions with a harpoon, and undoubtedly this would have required great skill. Although I feel it would be a shame to harm these beautiful creatures, their meat would also have provided for many families dependent on the land and sea for nourishment. I also imagine how a killer whale could come up destroy these sea lions for food, and luckily for these animals, this did not happen today. Reflections Portrait of a Steller's Sea Lion The weather also worked out beautifully, as I was contemplating about which day I should take this trip. The weather can change quite rapidly in Vancouver, and although the forecast portended of rain, it never actually materialized afternoon, and we had calm seas with high tide that allowed us to navigate easily to see the animals. It is quite an experience to come face to face with these strangers of the shores. As you will see, they each have their own unique personalities, and some of them actually bear quite a striking similarity to pet dogs. I hope that you enjoy these images, with the backdrop of the beautiful mountains including Mount Baker, the clear blue skies in the late afternoon on a gorgeous sunny day in Vancouver. There was plenty of light to allow my lens to performance its best, and although my 100 to 400 mm lens leaves something to be desired for bird photographs, it actually provided the perfect reach for seeing these beautiful sea lions. I will never forget this day, and I do plan on returning again before they leave for California. If you enjoyed these photos, please share them with your friends and family. I also encourage you to support the wonderful eco-tourism that is happening right in the backyard of Vancouver, at the docks in Richmond, British Columbia.